The publish page is split up into three steps «Verify Design», «Activate placeholders» and «Distribute Design». This step is designed to guide you through the process of verifying your design and its behavior by simulating user input using the «Wizard» Add-In. 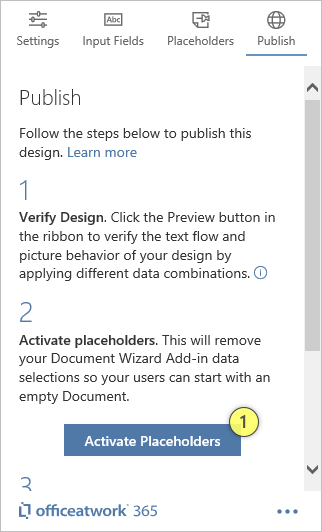 To launch the «Wizard» Add-In just click on the «Preview» icon in the Word Ribbon within the «Designer» Add-In ribbon group. Once you are finished with verifying the design you want to make sure that all your simulation data will be removed. To do this click on the «Activate Placeholders» (1) button. This will clear all of your simulation data and will reveal the placeholder text defined for each of your «Placeholders». Congratulations, once you are finished with verifying the design and you have removed the simulation data created with the «Wizard» Add-In using the «Activate Placeholders» button, you are ready to save and distribute your template as you require. Please consider using the officeatwork «Template Chooser» Add-In as the ideal solution to promote you templates within your organization.